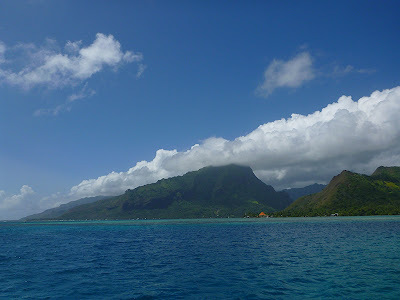 Moorea is an island shaped sort of like manta ray. Whereas a manta ray’s eyes protrude on two long palps in front of their mouths, Moorea is incised by two long, narrow bays extending inland---Cook’s Bay and Opunohu Bay. The northeast and northwest corners of the island flap outward like the wingtips of a manta ray, and the rest of the island mimics a ray’s hovercraft-like body. The day we arrived, however, we were met with a downpour moments after entering the anchorage. 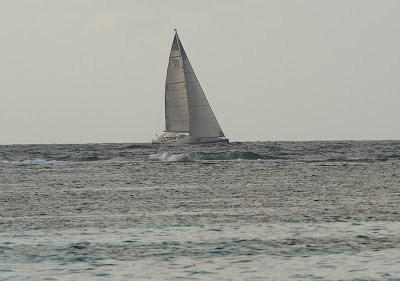 The wind started to howl and continued blowing through the night, with wind speeds in the low twenties and gusts up to 26 knots in the anchorage. Although Patrick got up in the middle of the night to check on the boat and to make sure we hadn’t dragged anchor (we hadn’t moved at the time he checked), we woke up in the morning practically alongside our sister ship (which also happened to be in the anchorage.) We had dragged anchor in the wee hours of the morning without feeling it, because the anchor was simply pulled very slowly through the mud by the wind. Luckily, Dream Time had dragged too; otherwise, we might have dragged right into her! Finally, we set a second anchor and stopped dragging. 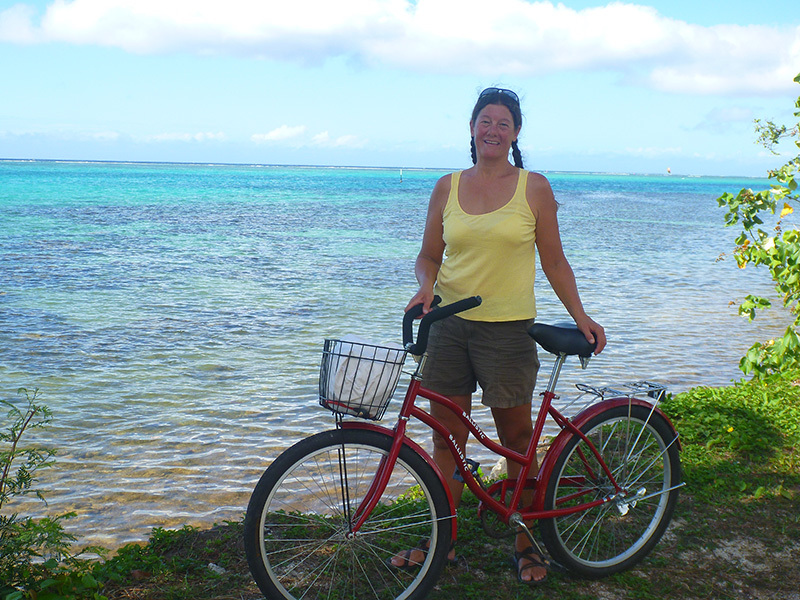 In Cook’s Bay, we rented bicycles to tour our immediate surroundings. 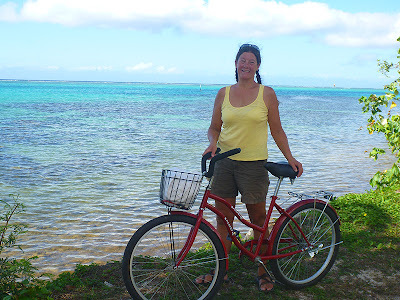 I hadn’t been on a bike since Isla Isabela in the Galápagos, and I was immediately suffused with the sense of independence, freedom and joy that bikes bring to their riders. It took some getting used to the bike, as it had been a long time since I'd ridden a bike without gears and with pedal brakes! We also visited several art galleries. Our favorite was Galerie de la Baie de Cook, where we were enthralled with the work of Vanuatu-born Olivier Louzé http://louzeo.fr . Louzé specializes in portraits of Polynesian subjects, and he has the ability to capture facial expressions brilliantly. His works exhibited in Galerie de la Baie de Cook show the artist's evolution through three distinct styles, culminating in the gorgeous style with its unique brown, olive, and ochre palette that he uses today. Louzé's paintings are exhibited in wood-with-lashing frames that he built himself which compliment his pictures. It's hard to imagine how Louzé's work could get any better; but he is still a young man, and it will be interesting to watch his style develop. After a couple of nights at anchor in Cook’s Bay, we moved to the anchorage at the east entrance of Opunohu Bay, just behind the barrier reef. 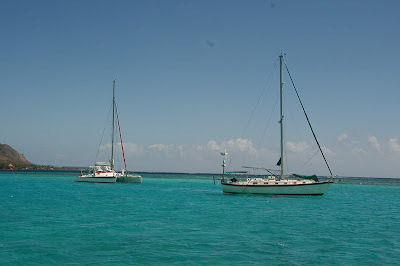 This was a perfect anchorage with a sandy bottom and turquoise water. Opunohu Bay, although spectacular, is on the jet ski freeway. Tourism is alive and well in the Society Islands, and cruise ships also visit this South Pacific isle. 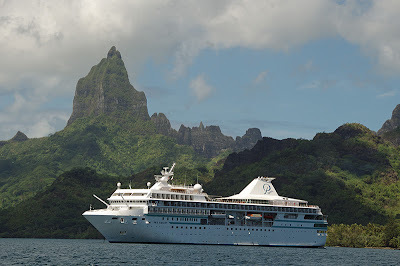 I wonder what Gauguin---who went to French Polynesia seeking the "savage" and the "primitive" (according to his letters) would think about having a cruise ship named after him? 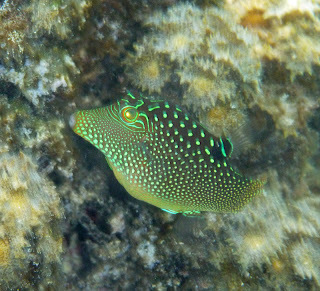 Our primary reason for stopping at this anchorage was that we had heard eagle rays frequent the bay. 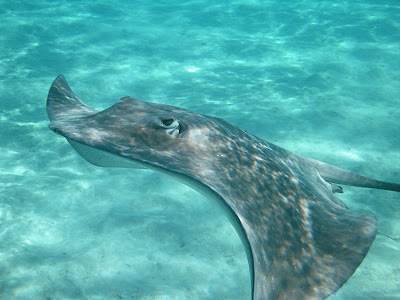 We did see one ray under the boat but did not observe them in large numbers. 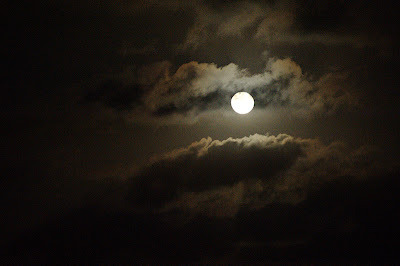 Had we spent more than one night there, however, we probably would have seen more rays. 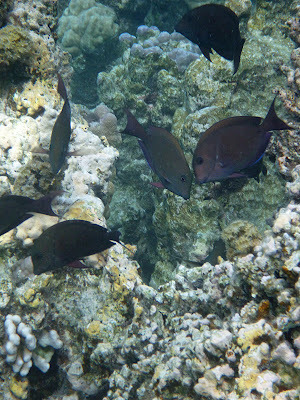 The anchorage was crowded and the reef low in diversity, so the next day we moved on. Our third anchorage in Moorea was on the west side of the entrance to Opunohu Bay, at the end of a channel outside the village of Papetoai. 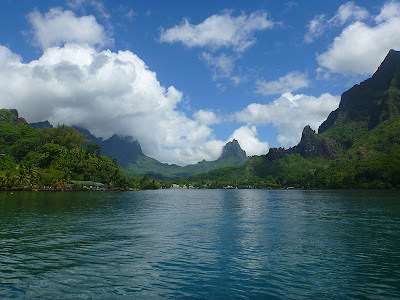 This was the most scenic and secluded of the three anchorages we visited in Moorea. 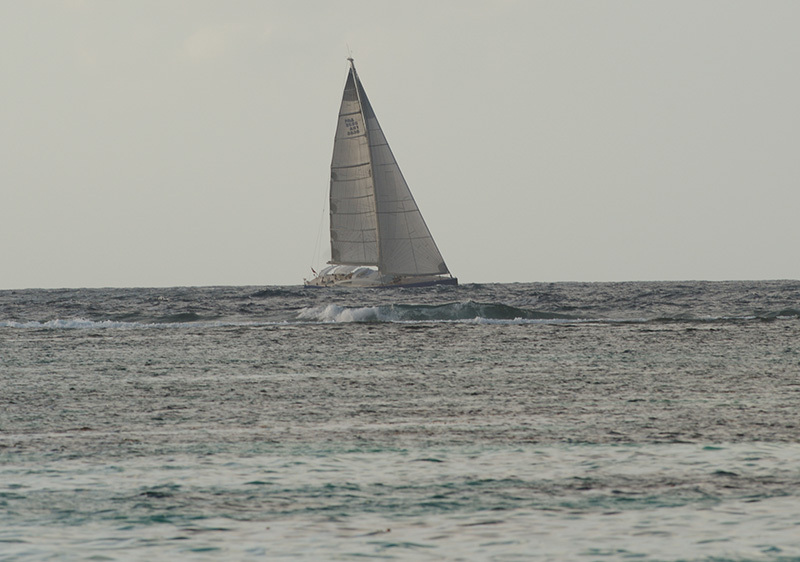 The first night, we had the anchorage all to ourselves, although we were joined by a couple of charter catamarans on subsequent nights. 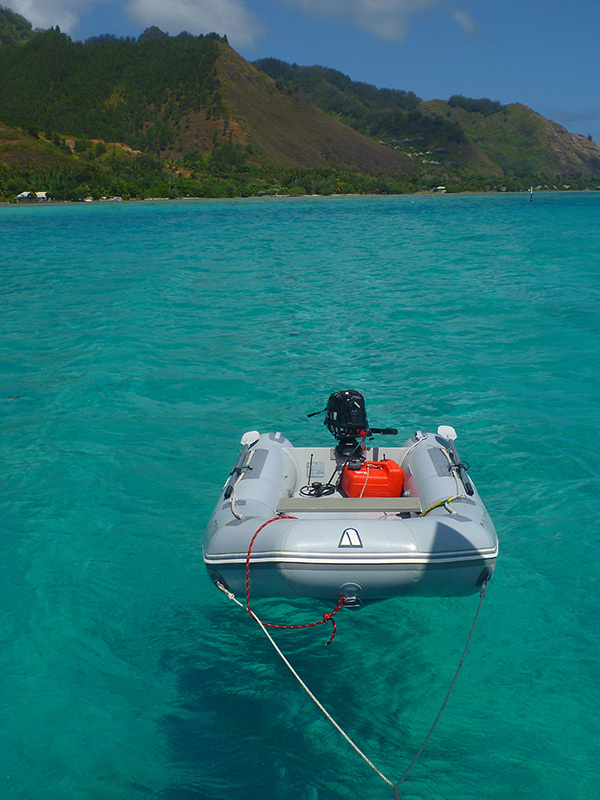 The anchorage is not ideal in the respect that it is easy to end up too shallow if the wind clocks around during your stay; this should be considered when selecting your anchoring position. 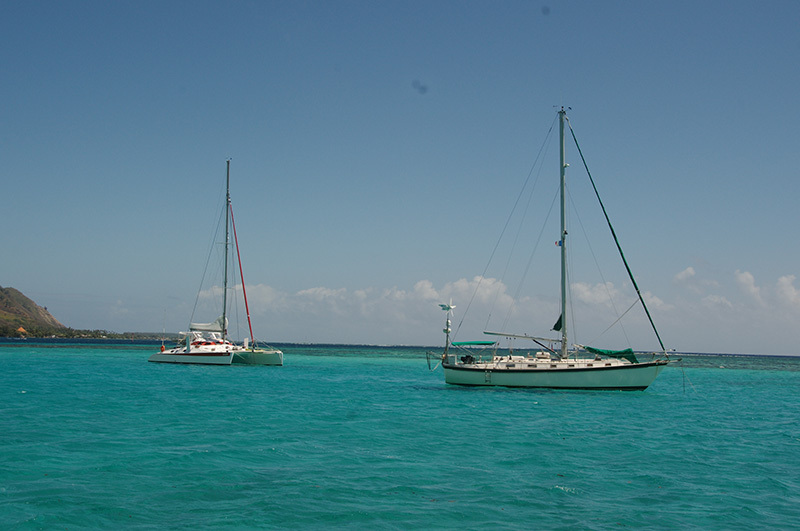 The third anchorage was a dinghy ride away from the area where tourist boats feed sting rays and sharks. We took our dinghy to the sand bar where the sting rays were clamoring up the bodies of tourists feeding them. We had heard that the sting rays themselves were “soft as velvet,” while their tails felt “like sandpaper.” One sting ray brushed its wing against my leg and it was, indeed, very soft. 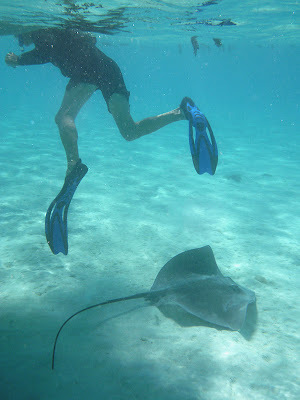 Since the sting rays are so used to being fed, they check out any boat in the area. 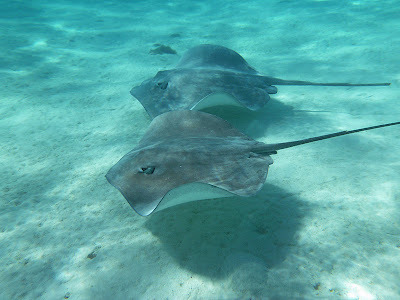 We were lucky enough to snorkel with the sting rays without having to feed them as they made multiple passes past our dinghy. 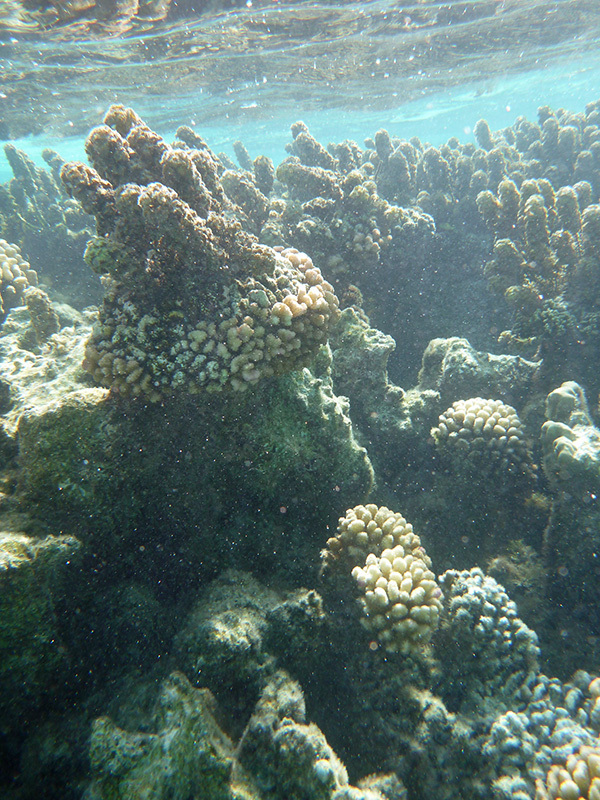 I also did some snorkeling in the nearby barrier reef. 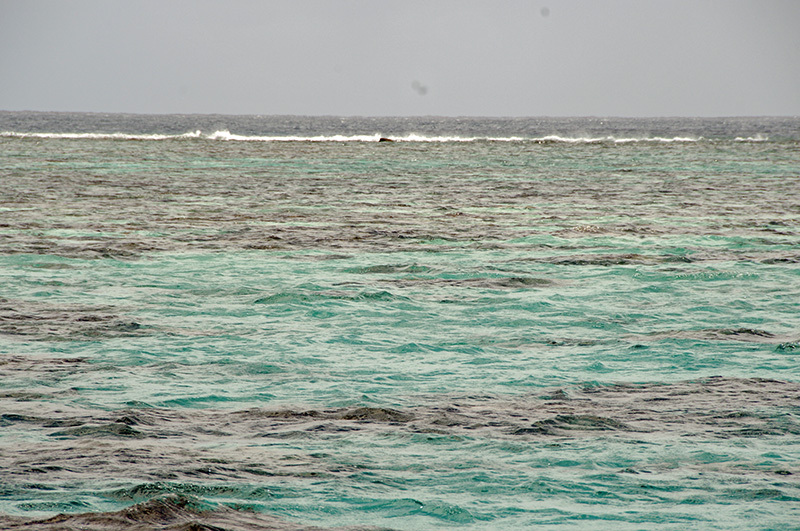 The reefs in Moorea are dominated by a brown algae, Turbinata ornata, giving them an overall darker appearance than the reefs we saw in the Tuamotus. We first saw this algae detached and floating in the water, where it could have been tree blossoms. (It reminded me of big-leaf maple flowers in the Pacific northwest.) Although native to the South Pacific, Turbinata ornata seems to occupy a large area of coral reef---real estate which would otherwise be inhabited by coral---and in that way, its presence could be detrimental to the reef. A little reading informed me that it is a matter of debate as to whether this algae is considered an invasive species, and that it is highly successful in developed areas where nutrients are high. I'm guessing the algae is a native species which has invasive tendencies. 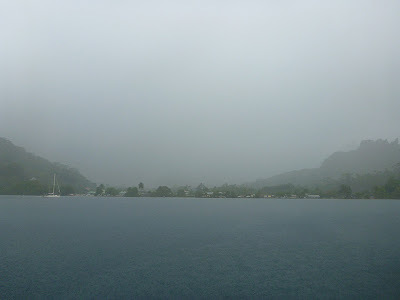 We didn’t have great weather during most of our time in Moorea. We ended up spending two days almost entirely on the boat because it was too windy or rainy to do much outdoors. 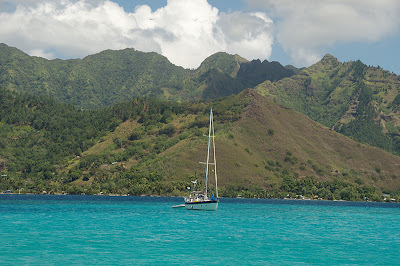 From our anchorage, we had a good view of sailboats outside the barrier reef taking advantage of the wind to enter and exit Opunohu Bay on their way to Moorea or bound for other destinations. We also had a nice view of August's blue moon, which Patrick captured on film. Recognizing the disturbing trend that we are having more and more weather days in which we are confined to the boat, I took advantage of the internet connection on Moorea to load up my Kindle with e-books so that I will have something to do when the wind howls and the rain falls. 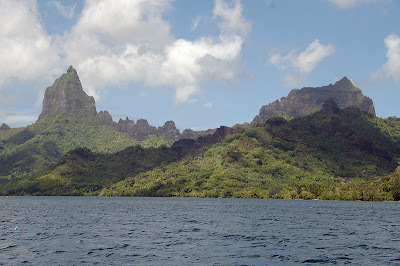 Although we still didn't have the weather window necessary to enter the pass at Maupiti (our intended next destination), after seven nights in Moorea, we decided we'd rather be underway than sitting in an anchorage in unpleasant weather. We pulled up our anchor and set sail for Bora Bora, where we are currently safe and sound. Beautiful scenery. Cannot get over the beautiful water. No wonder the tourists are everywhere.